Upset about moving from a big city to a small town, teenager Zach Cooper (Dylan Minnette) finds a silver lining when he meets the beautiful girl, Hannah (Odeya Rush), living right next door. But every silver lining has a cloud, and Zach’s comes when he learns that Hannah has a mysterious dad who is revealed to be R. L. Stine (Jack Black), the author of the bestselling Goosebumps series. It turns out that there is a reason why Stine is so strange... He is a prisoner of his own imagination - the monsters that his books made famous are real, and Stine protects his readers by keeping them locked up in their books. When Zach unintentionally unleashes the monsters from their manuscripts and they begin to terrorise the town, it’s suddenly up to Stine, Zach, and Hannah to get all of them back in the books where they belong. The 'Goosebumps' competition has now closed. Winners will be announced shortly. Competition opens at 5pm AEST on Sunday 22nd May 2016 and closes at 11:59pm AEST on Sunday 29th May 2016. Five winners will be chosen at random on Monday 30th May 2016. To successfully win, entrants must fulfil the above entry conditions before the time the competition closes. Current members/followers are eligible to enter the competition. Only one entry per person. Only one winner per household. To be a valid winner, the entrant must not have won a prize from SWITCH within the last 28 days. Each winner will receive one Ultraviolet Blu-ray copy of 'Goosebumps'. By entering, you agree to receive occasional emails from SWITCH in the future. If you decide to unsubscribe from these updates, any further entries will not be applicable. Only Australian residents are eligible to enter. 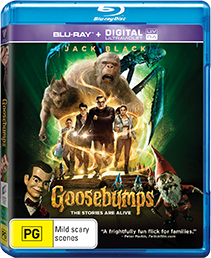 'Goosebumps' is available on DVD, Ultraviolet Blu-ray and Ultraviolet Blu-ray 3D on Wednesday the 25th May 2016 from Roadshow.